Apple iPad complete Touch Screen clip set. If you have worked on your iPad Touch Screen you know how easy it is to damage these small clips when removing the screen from the rear case. 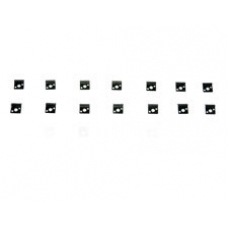 We can offer you the ability to replace any missing iPad clip with this complete set. * Original Apple iPad Touch Screen Clips. * Complete Set of 14 Clips.